This cheesy ham and turkey wrap gets its Mediterranean style on with a bit of Italian dressing on the side for dipping. 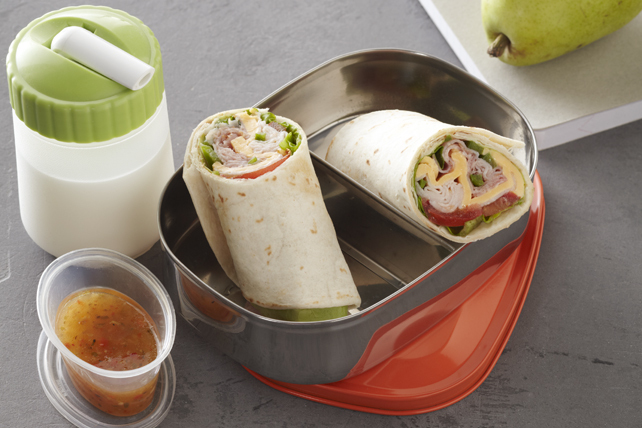 Layer tortilla with lettuce, tomatoes, turkey, Singles, ham and peppers; roll up. Cut wrap in half. Serve with dressing for dipping. Enjoy with a pear and milk. Prepare using a whole wheat flour tortilla. For easy dipping, take along dressing in resealable plastic bag.